Everything comes to life during this celebration of the museum’s 20th anniversary. Join us for art activities, snacks, and live music. Make sure to wear your best costume, prizes will be awarded. A new semester is upon us and for many this means a change in routine, and for some this is a start to a new phase here at Kansas State University. 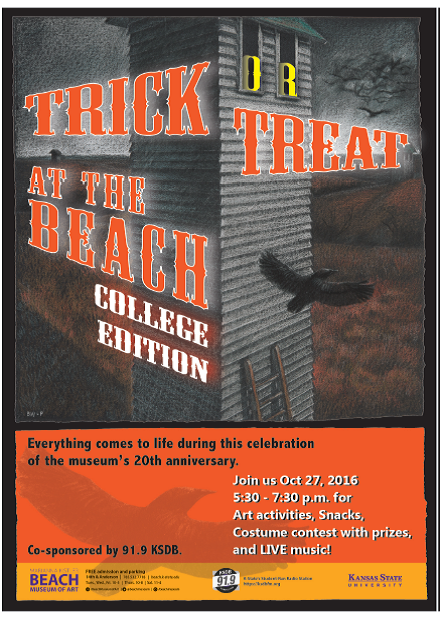 The Marianna Kistler Beach Museum of Art would like to invite everyone to explore the galleries and the programming planned for the semester. A full list of events at the museum can be found here on our webiste. Programming at the museum is Thursday evenings, generally starting at 5:30 and unless noted, are free and open to the public, some require reservations. Information about exhibition at the Beach Museum of Art, past, current and upcoming, can also be found on our website here. Closed Mon & holidays; Free admission and parking for museum guests.